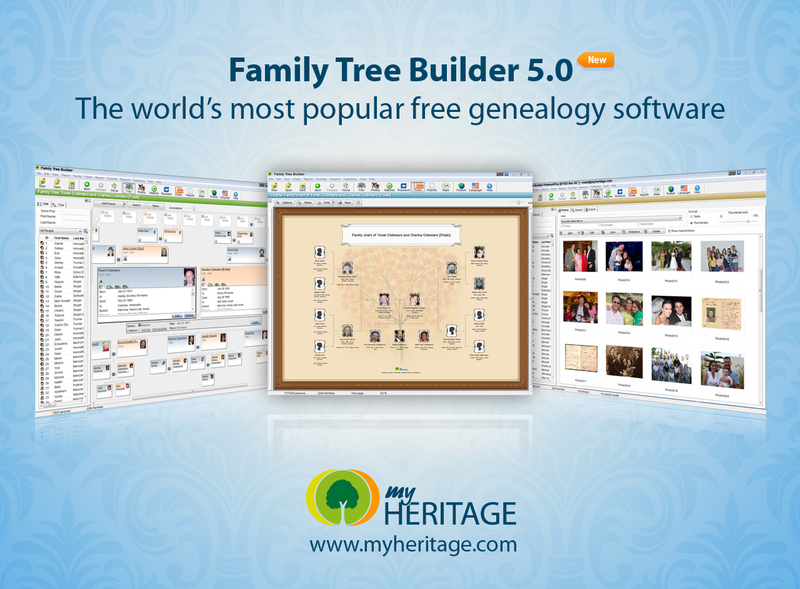 MyHeritage.com, the largest family network on the web, today announced the launch of Family Tree Builder 5.0, the most advanced and easy-to-use free genealogy software in the world. Introducing a range of new practical features, Family Tree Builder 5.0 makes researching, building, printing and sharing family trees easier than ever. The new ‘To-Do' lists and unique ‘Tree Consistency Checker' are amongst the useful new tools for genealogists, while the new fully customizable family tree charts and professional poster prints provide a colorful way for any family to showcase its past and present. With improved privacy settings, Family Tree Builder 5.0 also gives users more flexibility and security for sharing family history data. Family history enthusiasts and genealogists around the world use Family Tree Builder to find long-lost relatives, and discover and showcase their family roots. Popular free features, such as Smart Matches™ and Facial Recognition, empower users to overcome the challenges of family history research in a fun and innovative way. Family Tree Builder users can synchronize their data with a private online family site on MyHeritage.com. Family sites serve as an ideal platform for families to share their heritage and stay in touch – through photo sharing, event planning and other social networking tools. "We're witnessing a massive upward trend in people being passionate to discover their roots", said Gilad Japhet, Founder and CEO of MyHeritage.com. "Our newly released Family Tree Builder 5.0 software is the ideal companion in the journey to explore your family's past. Easy-to-use, packed with innovative features and completely free, it transforms family history into a hobby that is accessible and enjoyable for everyone." •	‘To-Do' Lists: A new feature that makes organizing and conducting research much more effective. Users can enter tasks that need to be done and associate them with people and locations, and organize the next steps they need to do in their research and prioritize them. Offers the ability to find all tasks associated with a certain person or location. •	Tree Consistency Checker: A unique and free tool that helps find mistakes in family tree data, automatically identifying errors and inconsistencies in 40 categories. The tool excels in detecting anomalies – for example if users have entered dates inside place fields or tagged someone in a photo before that person's birth – and shows users exactly how to fix them. •	Improved Privacy Settings: A centralized place for controlling privacy settings. Users can now make specific information (e.g., names, facts and notes) of family members private and prevent this data from being published to family sites, or exclude it from family tree charts. •	New Family Tree Charts: In only a few clicks, users can create beautiful family tree charts for free using a new easy-to-use chart wizard. With a dozen different chart types to choose from (click here to view), 18 predefined chart styles (click here to view), plus a wide variety of border designs, frames, background images, decorations, colours and fonts, users now enjoy thousands of combinations for personalizing their family tree charts. Charts can be saved in PDF format, which makes them easy to print at home and to share with others. •	Family Tree Posters: With worldwide shipping, users can now order a poster sized version of any family tree chart, either direct to their home or sent as a gift to a family member. Prices start from as little as $20. •	Custom Reports: Users can copy and export to excel data specific to a particular research project (such as a wedding or trip), sorting information according to their needs – e.g. by region, emails of particular individuals, information on reunion attendees etc. •	DNA markers: Users can enter results from a genealogy DNA test or be directed to over 10 companies that conduct such tests. This information is encrypted. •	Plus dozens of additional enhancements.